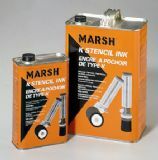 Manufactured specifically to work in harmony with Marsh Stencil Machines. Marsh oilboard is treated with a special blend of triple-boiled linseed oils to resist ink bleed-through. After treatment with the oil, the board is cut with the grain in order to further strengthen its rigidity. This whole process provides you with clean, sharp marks with your stenciling system (stencil machine, ink, applicator, oilboard). Further, the high absorption of oil in the board, self-lubricates the punches of your stencil machine to extend the life of the machine.